A 300 level student of Osun State University, (UNIOSUN), Osogbo, Amao Adekunle, has been arrested by men of the Osun state police over unlawful possession of gun among other dangerous weapons. Adekunle was paraded alongside one Adeshina Olarewaju, was said to have been an undergraduate in the Department of Mathematics of the institution. The duo were said to have also been caught with some money in Naira and Dollar currencies. Denying the allegations that he has been part of criminals who have been dispossessing people of their belongings, the undergraduate explained that he only accompanied Olarewaju to the hotel where they were arrested. Crying profusely, Adekunle told our correspondent that, "I don't know anything about the gun, cutlass and even money. Olarewaju is just area brother to me. Since my mum died in 2015, I have been in school. On that day, this brother called me and asked me to follow him to his in-law's house. "We were on our way when someone called him and asked him to come to an hotel, it was at that place we got arrested. Please help me, my career is ruined, I am innocent of this crime." He added in an emotion-laden voice. 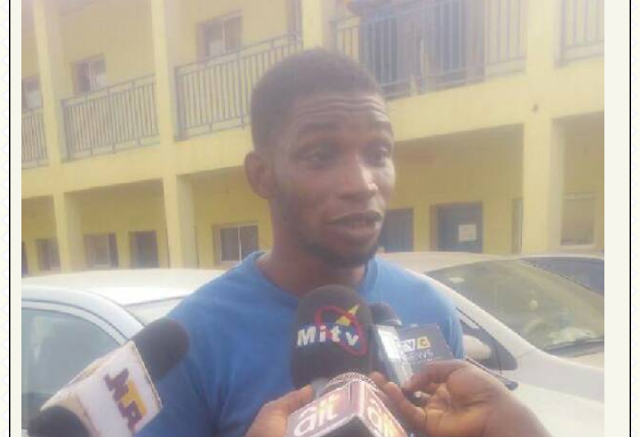 Asked if Adekunle is innocent as he claimed, Olarewaju said, "Yes, he doesn't know anything about these things and I have told the police, he only followed me to that hotel. I own the gun, it has been with me since 2014 and I use it to rob people." Another group paraded was a ten man gang of armed robbers led by Kehinde Ogunyinka who specialized in dispossessing people of their vehicles. The Commissioner of Police in the state, CP Fimihan Adeoye, said six vehicles were recovered from the gang. He explained that the gang would visit their victims at their residencies and cart away their vehicles. Adeoye said a particular vehicle was repainted and was used for commercial purposes by the gang leader, Ogunyinka. Adeoye disclosed that the church bus was rebranded and inscribed "State of Osun" and was being used for commercial transportation by the gang leader. In a chat with Amiloaded, Ogunyinka however disclosed how he regretted all his actions urging youths to shun crime.